The field of computing has expanded rapidly over the past 10 years, and students need more information about the field and its related careers. In reality, there is no single computing discipline but at least five. Including different sub-specialities, there are dozens of possible computing educational paths for prospective students. 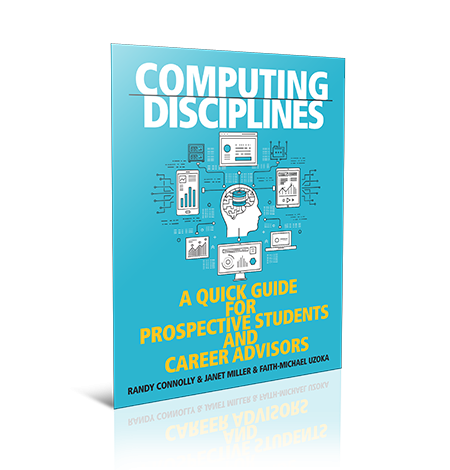 This guide, produced by Mount Royal University and funded by CERIC, outlines the five computing disciplines identified by the Association for Computing Machinery (ACM) and how the disciplines relate to specific job titles and tasks. Information about additional training and specializations are also provided along with links to Canadian occupational information resources. The guide is designed to support prospective students, career practitioners, academic advisors and career counsellors by outlining these five areas of practice. This information will help students to better understand what each one of the computing disciplines does and which best suits their interests, talents, skills and abilities. Purchase bulk copies (10 or more) at $10 through CERIC by contacting sales@ceric.ca. Thank you both for creating and providing the career world with the Computing Disciplines – ‘A Quick Guide for Prospective Students & Career Advisors.’ This was a much needed resource and is absolutely a pleasure to read, easy to work with and effective for supporting exploration. I am very excited to put this to good use with my team and my clients! Thank you for the wonderful resource you funded on Computing Disciplines. It is clearly presented and will be very helpful for advisors and students. I will pass it along to many who many find it useful.